HOW QUICKLY CAN I GET A PRICE QUOTE? It is our policy to return quote information on standard items on the same day as requested. And our BottomLine™ quote tells you the actual price per piece - no hidden costs! HOW DO YOUR BOTTOMLINE™ QUOTES COMPARE? They are competitive but not "cheap". You get what you pay for, the old saying goes. The quality, service, and reliability you receive from CounterPoint® is just not available from "cheap" suppliers. IF I ORDER MY MATS TODAY, WHEN WILL THEY BE SHIPPED? We have found that the main factor determining the flow of a job through our system is the useability of submitted art. If our art guidelines are followed and our production specifications considered when the art is created, our standard turn around time is five days. Rush services are available depending on our production schedule. Call your Product Specialist for scheduling of your job. NOTE: Art that must be adjusted by us to conform to our specifications will be submitted back to the customer for approval of necessary changes – this may result in delays. To avoid delays, be sure all art is correct before you submit it. WHAT IS YOUR MOST POPULAR SIZE AND SURFACE? Our most popular size is 11 x 17 inch with our standard 3/8 inch corner radius. Vynex® is our most popular hard surface mat. 1/8th inch is currently our most popular thickness for all surfaces. See our Most Popular Counter Mats page. CAN I GET A CUSTOM COUNTER MAT? 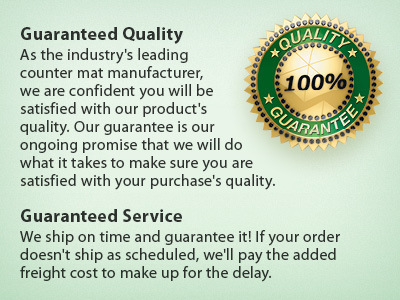 Due to the nature of our business, virtually ALL counter mats we produce are "custom". Our sales staff will be happy to work with you concerning custom art, custom colors, custom shapes, etc. CAN I EMAIL MY ART FILES TO YOU? You may submit files up to 3Mb in size via email directly to your Sales Counselor. Ask your Sales Counselor about our upload utility to send files larger than 3Mb. Files larger than 80Mb may be shipped to us on disk. Please also send us a printed color sample of your art files so we can be sure the digital art we receive meets your expectations. HOW DO I TELL IF MY COUNTER MAT IS MADE IN THE USA USING USA-MADE MATERIALS? For rubber based mats, it’s easy. Turn the mat over and look at the back. There are also odor and texture differences. The easiest way to ensure your counter mats are manufactured in the USA with USA-made materials is to buy them from CounterPoint.